Ensuring produce respects animal welfare standards and providing maximum health guarantees is all in a day’s work for our egg producers. 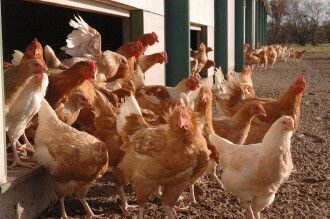 These are essential improvements to which Terrena has now added widespread heat-treated feed to egg-laying units. This provides additional health protection for this livestock and reassures the distribution and processing industries. Over the past few years, Terrena has greatly developed its free-range and organic chicken sector to meet with the demands of this fast-growing market.